Development of special army vehicles in 1928 led to creation of first 1.5-ton trucks G3 (6x4) followed a year later by a modernized 68 hp G3a model. Bussing-NAG and Magirus companies were produced its own trucks likeness to Mercedes-Benz model, and created the first standardized 1,5-ton range. Compared with them, the G3a model had the longest wheelbase (3000 mm). 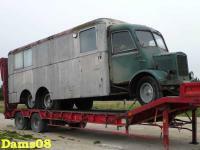 It was offered as a chassis for command cars Kfz.77, radio vehicles Kfz.61 and other. From 1929 to 1935 about 2.1 thousand G3a trucks were made. Engine was Daimler-Benz M09, gasoline 6-cylinder with a working volume of 3,688 cm3. Gearbox was 4-speed. Maximum speed - 65 km/h.